First of all, HI! And Welcome to 2015!! I’m sure a lot of you are here to get back on track with healthy eating and to find some new and delicious Weight Watchers Recipes, and I certainly will do my best to deliver. But part of my New Year’s Resolution was to spend less time working and more time enjoying my young children before they are too old to want to play with me. So, I haven’t been posting as much as I used to, but I still plan on posting at least 1 new recipe a week. ;) Just wanted to address that, in case any of you were wondering why I’ve been posting less. With that being said, today’s post is for an amazingly delicious and easy side salad recipe that is so incredibly flavorful, my mouth was watering just making it! My Asian Red Cabbage Salad works great as a side dish, or you can double the serving and top it with some grilled chicken breast for a filling and delicious lunch. It’s crunchy, tangy, salty, and a little sweet….total perfection! This is one of my favorite Weight Watchers Salad Recipes to make whenever I have extra cabbage on hand. Enjoy! 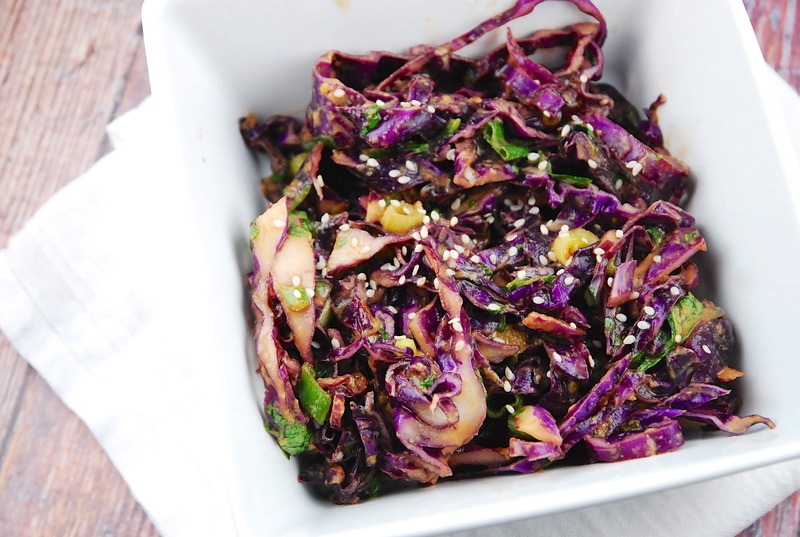 Crunchy, tangy and incredibly colorful, this Asian inspired salad is a wonderful Weight Watchers Salad Recipe to enjoy time and time again. It’s prepared quickly and is loaded with mouthwatering flavors. In a large bowl toss together the red cabbage, green onions and cilantro. In a small bowl, whisk together the remaining ingredients. Add to salad bowl, and toss well. Let sit for about 10 minutes. Garnish with a sprinkle of sesame seeds if desired. I’m afraid honey is not vegan…. How long do you think this would last in the fridge? Love your recipes but I can’t find where to print them out? Your food looks beautiful and I have subscribed to your website. My question-how do you go about printing a recipe-just the part outlined around the ingredients and instructions, without printing the pictures and the long index on your right? Thanks! You could cut and paste it. ???? hit printer friendly and it will bring up a beautiful color picture of this post with the recipe without this stuff here to the right and then you just go to the top and hit print. I love this salad! Such a perfect winter combination, thanks for sharing this recipe!